There are so many claims and propositions about Christianity that at a certain point, it would be strange not to have questions about Christianity. The purpose of this 5 week class is to help investigate some of those questions. To do that, this class will introduce the Christian faith, not primarily as a set of doctrines, morals or practices, but as an alternate story of the world. Part lecture and part discussion this class will engage with the some of the biggest questions of Christianity such as: who is Jesus, why believe the Bible, what is the purpose of the Church, and what does Christian Life look like? The class will consider what each of these big topics tells us about God, ourselves, and our world today — and how each of our lives finds its true meaning as part of God’s larger story of redemption. This Sunday, when we will celebrate the Resurrection, the weather is supposed to be beautiful. I hope you will join us and bring a friend or neighbor for either our Sunrise Service or our 10am Celebration Service. Both will be wonderful opportunities to worship and hear again the good news of the Gospel. But before we arrive at the celebration of Easter we first follow Jesus’ journey from the triumphal entry into Jerusalem on Palm Sunday, to the Upper Room on Maundy Thursday, and all the way to the cross on Good Friday. This year in our Maundy Thursday service we will reflect on a sometimes overlooked aspect of the Holy Week events. On the night before he went to the cross, Jesus took his disciples to an upper room to celebrate the Passover meal. Before they broke bread, Jesus stepped away from the table and began to wash the disciples’ feet. In this gracious act Jesus is teaching the disciples about service and humility. He tells them that because he has washed their feet, they should also wash the feet of others. More than just a just a symbol of service though, this event was also meant to reveal to the disciples an inescapable truth – they needed to be cleansed by Jesus. And not just their feet, but their entire being. The disciples, in their brokenness and sin, needed to be washed and cleansed in order to attain salvation. Only Jesus could do this for them. When he the washed their feet that Thursday night he may have removed some dirt from their skin, but on the following day as his blood was shed upon the cross his sacrifice expunged their sin forever. Only Jesus could do this for them, and only Jesus can do this for us as well. 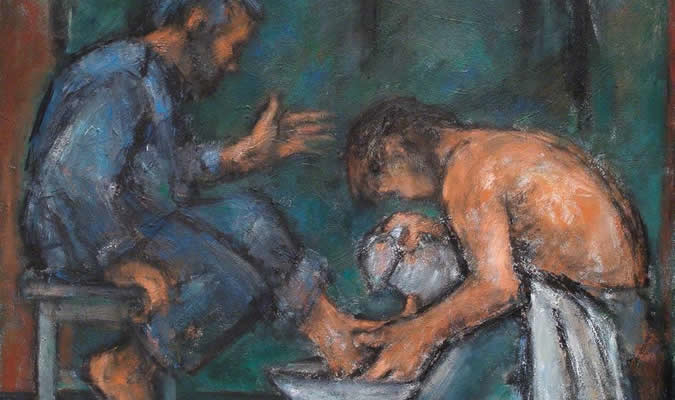 At this year’s Maundy Thursday worship service we will make time for the washing of one another’s feet. While this optional and voluntary part of the service may be uncomfortable for many of us (because we have a thing about feet, or because we are not used to being served in such an intimate way), it also acts as a powerful, tangible reminder of what Jesus has done for us. Each of the services of Holy Week are invitations to experience again the fullness of God’s love as revealed by Jesus’ death and resurrection. We are served by Jesus as he pours himself out for us, let us also be sent out with an assurance of salvation to serve others as well.